Signature 60wt Cotton Thread is 3 ply, 100% cotton thread. It is very fine, yet exceptionally strong. With excellent sewability at high-speeds, Signature 60wt Cotton Thread performs well on both long arm and home quilting machines. 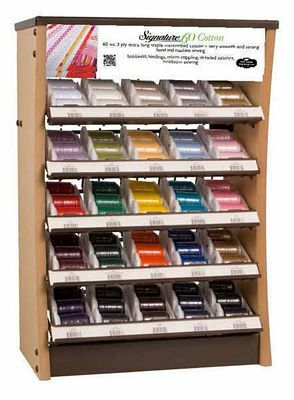 It is an ideal choice for use in the bobbin, heirloom sewing, micro stippling with sheer to light weight fabrics. Available on a 1100 yd mini-king snap spool. Signature Art 60S.